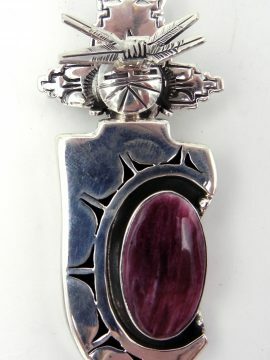 Navajo silversmith Alex Sanchez, known for his petroglyph style pieces, created this lovely pendant in that signature style. 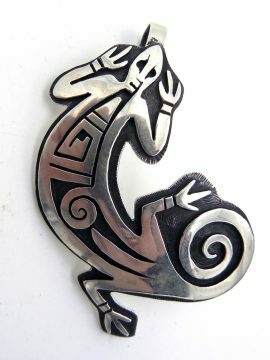 The piece showcases a round, sterling silver panel at the bottom, appliqued with Alex’s recognizable petroglyph designs including a hand, dragonfly, fetish bear, three whirlwinds, and flattened dots. The round section is finished with a single coral piece at the bottom, deep red and set in a simple sterling silver bezel. 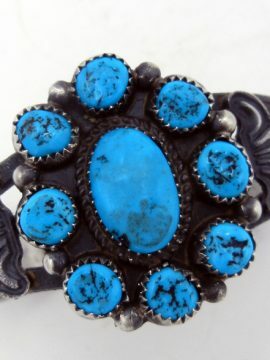 The petroglyph patterns stand out beautifully against an oxidized, textured backdrop, while the entire panel is connected to two unadorned sterling bands that extend upward and merge into a rounded diamond shape, the piece’s large bail set at the merge point. 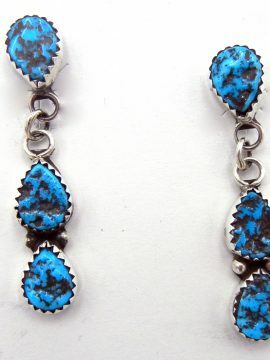 4 1/4″ long including bail x 1 1/4″ wide.